Archbishop Gabriel Justice Yaw Anokye of Kumasi, Ghana is the newly elected President of Caritas Africa. In this interview, he shares his vision of a Church for the poor in Africa. Q: What does the General Assembly mean for delegates from Africa? 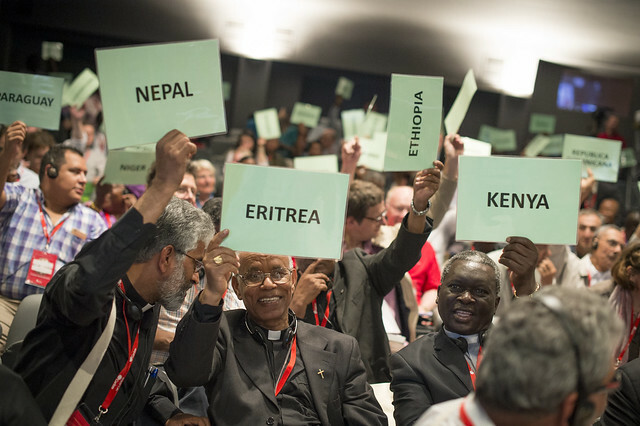 A: Caritas Africa attends this 20th General Assembly in fidelity and in brotherliness as one family. This year as the theme tells us we all want to care for creation, we are one human family, one creation and every part of this family must come together to think of the whole. We have also come to join our brothers and sisters from other Caritas member countries to form one big family, share success stories and challenges while learning from each other how to chart the way forward to achieve our mission and vision of serving the poor and caring for creation as Caritas. Q: Looking at what Pope Francis says about a “Church for the poor”, what does this mean in Africa? A: The mission of Christ as announced by Himself in Isaiah Chapter 51 “The Spirit of the Lord is upon me, He has anointed me to bring the good news to the poor…” Similarly, in Christ’s sermon on the Mount; the first Beatitudes says “Blessed are the poor in spirit”. So you can see that Him though rich in His divinity became poor (Philippians 2:6), in order to make us wealthy, divinized to share in His riches; this is the philosophy, theology, vision and indeed the mission of Christ; to raise the poor, to bring the lowly to a higher level, He didn’t come to save angels or raise again those who are already high up but to raise the poor, lowly, widows, orphans and strangers. These categories of people we call the poor are treated as the apples of His eyes and are kept very well by God Himself who hears the cry of the poor. Therefore, Caritas which is issued out from the heart of the Church’s missionary and charity activities must also care for the poor. We do support the Pope as he reminds us of our duty to care for the poor. So for the Church to be able to serve the poor must be poor “a Poor Church” to be able to enter the ghettos, the sowetos, the zongos of our villages and hard-to-reach communities support the poor where they are as Caritas (Church). Q: Going forward, looking at your role of being in charge of Justice and Peace Commission, how do you see Caritas and Justice Peace working together in member countries of the African Region, especially where there exist in parallel? A: Before my election as president of Caritas Africa, I was and I still am the second vice president the Symposium of Episcopal Conferences of Africa and Madagascar (SECAM). As the second vice president, I am in charge of Justice and Peace Commission, good governance, advocacy and lobbying (talking for and against), I’m also in charge of development, migration and health. All these areas concern the human being as the focus of our activities. As we speak for justices and advocate for human rights, we are doing the work of Caritas, the work of love. Because if I look for justice for others, advocate for peace, good governance, transparency and accountability from African leaders to ensure growth and development for the common man, I’m showing love which means Caritas. Bringing food to the suffering, visiting those who are sick or in prison, being in solidarity with those affected by earthquake and other natural and man-made disasters, is the visible part of justice, peace and reconciliation. Justice, peace, development and reconciliation are integrated into the work of Caritas. One is more visible and the other structural but the two go together. Q: As the new president, what is your vision of Caritas Africa? A: Let me start by referring you to what Jesus himself said in Matthew 7:15 “I came to fulfill not to abolish”. In line with this, whatever vision there is already for Caritas Africa is what I am going to fulfill and our vision is to “give life in abundance” (John 10:10), I am not going to change that vision to fulfill it by making sure it is owned by everybody, loved, cherished and implemented. I am going to talk about it, remind members of the African region. The mission to achieving this is surely to bring people to know it, talk about it more, form people and also commission people do precisely that. So I am going to align with the old vision of Caritas Africa and ensuring that we achieve our mission of reaching out in love to our brothers and sisters who are in need.